My dad once told me that when he first arrived in the U.S. in the 1920s, some Americans would say the family name in an odd way to his face. But he told me some insisted on taking the life and beauty out of it. Ewwwww. It has been the blackboard screech of my life. Torture to my ears. I feel the same way every time I hear another G-word, shortened and bastardized in the same ugly tone. But to hear the beautiful name Guantanamo attached to the U.S. detention camp called “Gitmo” is a reminder of real claims of actual torture at the facility established by the Bush Administration in 2002. How much longer must it exist so that our government can simply lock up alleged terrorists and throw away the key? In 2005, Amnesty International called it the “Gulag of our times.” In 2006, the UN called for its closure. In 2009, as part of an election promise, President Obama tried to shut it down, even suggesting it would get done by 2010. On Tuesday, with less than a year left on his term, the president figured it was worth one last try to shut down the Guantanamo Bay camp on principle. Sounds good. Of course, his Justice Department is trying to pry open your iPhones. But that’s another matter. My first reaction was what would happen first: Guantanamo’s closure or a Scalia replacement approved to the Supreme Court? The reality is neither is a good bet, considering the obstructionist politics of the day. The announcement was like stoking a fire, as if the country needed a little extra polarization. Immediately, Sen. Bernie Sanders was for it, of course. So was Sec. Hillary Clinton, not surprisingly given her embrace for all things Obama. But she was on the record against Guantanamo since 2008 she said during a CNN Town Hall. But the Republicans on the day of the Nevada Caucus were pretty clear. Close Guantanamo? Those auditioning to be the future leader of the free world were unanimous. “When I’m president, if we capture a terrorist alive, they’re not getting a court hearing in Manhattan, they’re not going to be sent to Nevada, they’re going to Guantanamo,” said Sen. Marco Rubio. And Donald Trump, the man who would punch out someone who exercised a little free speech and came out as pro-torture on the campaign trail, was even more direct on Guantanamo. Of course, he said it as offensively as possible. It’s just another indicator how government doesn’t work when no one works toward consensus. And it did seem like we were on the road to consensus in the not-too-distant past. The Bush Administration did transfer 500 of the camp’s more than 700 prisoners to different places around the world, an admission of sorts that Guantanamo was more wrong than right. It’s the reason why there are just 91 prisoners left, with maybe another 50 to be transferred elsewhere. It shouldn’t matter if they’re locked up in a maximum security military site. But watch people try to make this the next big “Not In my Backyard” issue. The president’s pitch is actually ready-made for small government fiscal conservatives to embrace. 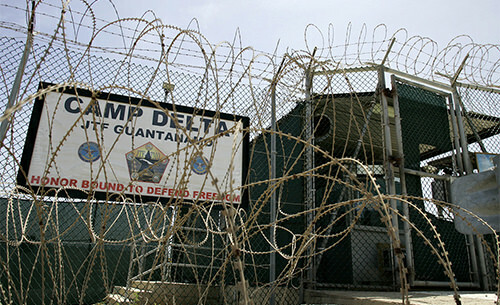 Shutting down Guantanamo saves money–more than $85 million a year. But that’s too small a price for the GOP candidates to give in to logic or morality. “This is about closing a chapter in history. It reflects the lessons that we’ve learned after 9/11,” the president insisted, adding that Guantanamo should not set a legal precedent for the future. Well, it is still Black History Month; the president has a right to dream. John Yoo, the UC Berkeley law professor who was the Justice Department attorney responsible for helping the Bush administration justify its extreme anti-terrorist measures, was on the news shows, flogging his new book, as well as what he sees as the president’s overstep of authority. Yoo said the Congress’ ban on spending any money to move the Guantanamo prisoners to the U.S makes it “dead on arrival.” And he pointed out the only one to overstep Congress on authorization was Abraham Lincoln before the Civil War. It will be repeated by every Republican politician for the next year. This is politics in America, where no one acts like they’re on the same team, and bipartisanship is a dirty word. Obama still hasn’t kept his promise. But he’s exposed the obstructionists on national security and made a hot button even hotter on the campaign trail. It’s where we are in American politics. And it’s not a great place if you’re interested in righting wrongs or at the very least, getting things done. “Are we going to let this linger on for the next 15 years, 30 years,” the president asked rhetorically? Sadly, unless sanity prevails, I think we are. Though I’ll go out on a limb and say the Scalia replacement will probably happen within 15 years. You’d have to be a real fan of dysfunctional government to find satisfaction in a high court deadlocked at 4-4.